"Studying classical piano has been one of the most fulfilling and rewarding experiences I have ever taken part in. There is no feeling like sitting down at the piano and reproducing all the music that I love to hear. It is equally rewarding, if not more, to be able to teach others the beautiful art of piano playing. I aim to tailor my lessons to the goals and personal taste of the student, and also to help develop a natural curiosity of the instrument. My main objective is for the student to enjoy every second spent on the beautiful isntrument, to stay inspired and motivated resulting in a musical experience incomparable to antyhing else." Frank taught music at the elementary, middle, and high school levels; he taught general music classes, music fundamentals, world music, and ran choral ensemble rehearsals. His students have ranged from young to older beginners, intermediate and advanced students. Frank is a graduate of William Paterson University with a Bachelors degree in Music Education. 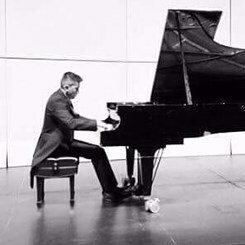 While at WPU, he studied with internationally acclaimed pianist Frank Pavese and performed in a wide variety of settings ranging from school recitals and open mics, churches, as an accompanist and of course for his own enjoyment.